Note (Oct. 14, 2016): Part of this work was used in a collaboration between the AP here and USA TODAY NETWORK here. 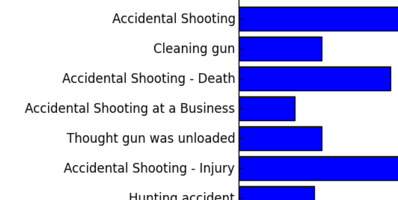 What are the most frequent kinds of gun-related incidents? Where are they located and which demographic groups are affected by them? This is part of ongoing work with Professor Felisa Vázquez-Abad of Hunter College. This is the preliminary draft submitted for the WODES 2016 conference. The particularly tricky bit this time around was our decision to use a less trivial example scenario: instead of just a deterministic function plus a normally distributed noise term, we chose to construct a more complicated stochastic function. Crucially, since we wanted to speak to the usefulness of gradient estimation, we wanted a function where IPA derivative estimation could be used.